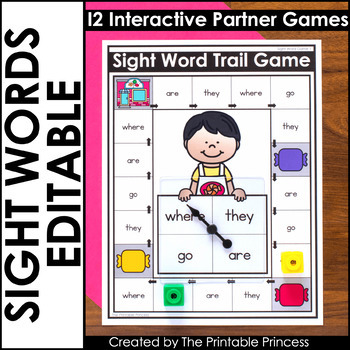 These sight word games are a great way for Kindergarten students to learn to quickly read and recognize sight words. They are easy to prep for teachers, just print and laminate - no cutting required! Students will find them interactive and hands-on. Plus, they are meant to be played with a partner or small group which makes them extra fun! 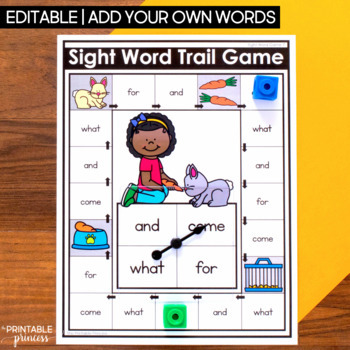 These sight word games for kindergarten are quick to play and are great for time fillers. They are also ideal for morning tubs or early finishers. Of course you can also use them for literacy centers too! 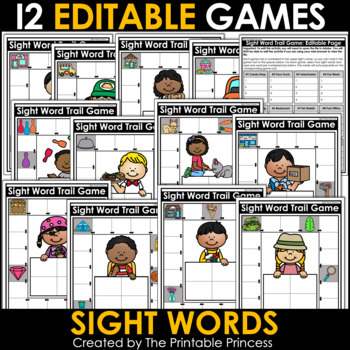 This resource includes 12 editable sight word games with year-round themes. ⭐️ There are no sight words included in this resource. You will need to use the editable page to add your own sight words. You will type the sight words once for each game and they will auto-populate for you. Please note that you will need to open the file in Adobe to edit. You will be unable to edit when viewing the file in your web browser. Students will start on the first space in the upper left corner of the game board. They will spin the spinner and identify the sight word they spun. 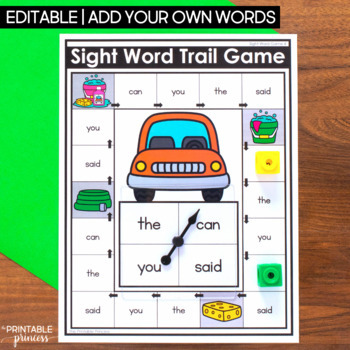 They will identify the sight words on the trail and move their game piece to the nearest sight word that corresponds to the one that they spun. The gray shaded themed spaces are free spaces. The first player to make it all the way around to the last space on the game board is the winner. To win the game, the player must spin the final word shown in the last space on the game board.